The business model that will save our industry starts with a revenue model — but what does that even mean? A revenue model is a company’s plan to get money from customers in exchange for a product or service. By my way of looking at it, there are four – and only four – ways media companies can get revenue from their customers. 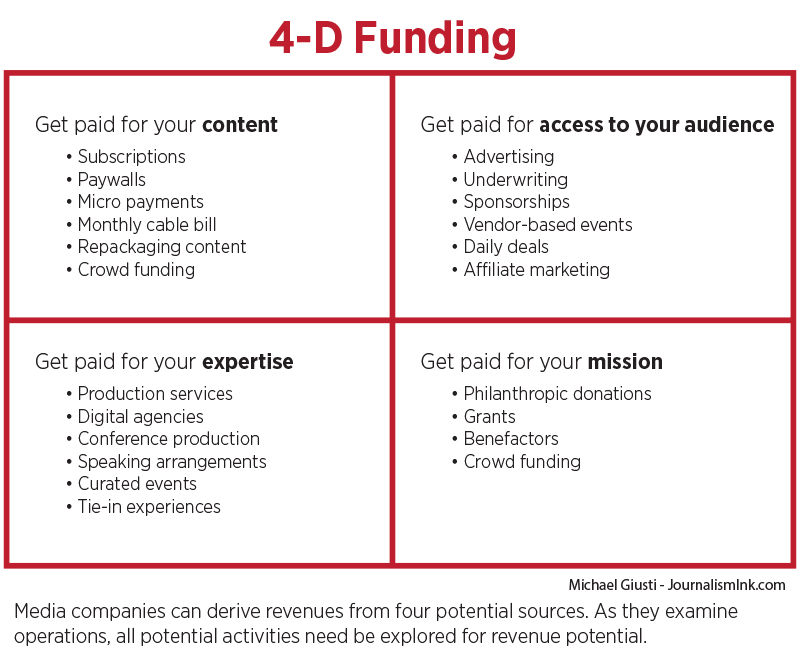 It doesn’t matter what media company we are talking about, they use the same four methods: what I have taken to calling the 4-D Funding model. All media companies use a mix of those four dimensions – daily newspapers, local TV stations, public broadcasting, nonprofit news outlets, even Disney, Apple, the music industry and the cable companies. If it’s a media company, this is how they get paid. Now, that is not to say that all these media companies are using every available funding source. In fact, most media companies latch on to one or two, and if they are progressive, three funding sources. Very few media companies use all four dimensions. Neglecting these other dimensions leaves their business flat at best, and unstable at worst. Without rounding out their potential funding sources, the decay of a key category can cause their entire operation to teeter and topple. Just look at the hoops the print industry is jumping through because it got so reliant on advertising and subscription revenues. Each of these dimensions deserve entire posts of their own. But for now, let’s take a quick tour of what I am laying out. OK, so, how do you use this? Well, first, you start by examining the stable of offerings your company has on its menu. What do you do well? What could you do well? Who finds these offerings valuable. What customers would be willing to pay for that content. If you jump in here and say nobody wants to pay for news, then maybe you need to reevaluate what you are producing. If it isn’t worth paying for, then is it truly valuable? And if you say “but information wants to be free,” I just might slap you. Next, take a look at the audience you are pulling together when you are creating that content. What do you know about them? Who are they? How old are they? What gender are they? What do they spend money on? What are their hobbies? Once you know those metrics, then you know who you need to be targeting – business who find that audience attractive are the ones who will pay you for access to them. Now, think about ways in which you can get those businesses’ messages in front of that audience. OK, so here is where the old journalist in me comes out – you need to make sure that when you are matching audience with business, you are using methods that are ethical. 2013 seemed to be the year of the “native advertisement” – advertorial content in other words. I abhor the idea of native advertisements. If the only way you can make money is by selling your credibility, then drop me a line. I will see if we can come up with some better methods. But please don’t offer your content and your credibility to the highest bidder. Now, everything I have said here so far should be a refresher for anyone who has even a passing interest in media business — newspapers have been selling access to content and access to audiences for hundreds of years now. It is the next two dimensions that actually can help round out the news industry. Think about all the things you need to know how to do to produce good, high-quality news. Reporting, writing, design, production, distribution, sales, marketing … all those things are hard. And they are things that we have learned to do rather well. Take a look at your operations. Do you have spare capacity in any of those areas? Take a look at your market. Are there people who would be willing to pay you to help them do some of these things? Newspapers have been printing papers for commercial clients for years. But look at the rest of the operation — what is within your core competencies that can be monitized? It might actually be worth hiring a few extra designers if you can then employ them on commercial products. The real challenge of this exercise is to critically identify your customers. Why would they choose to give you some of their hard-earned money? Are the things that you are doing contributing to efforts that will make them want to give you more of their hard-earned money? If not, then maybe you need to drop those activities that do not add value, and instead focus your efforts on the things people value. One of my favorite sayings in the nonprofit industry is “no money, no mission.” If you don’t have revenues, then the rest just doesn’t matter because you won’t be able to afford to do anything. You can have all the most noble intentions, but without cash, professional journalism dries up. And without customers, there is no cash. And that is where I say “I’m glad you asked.” Because that is where that last dimension of funding comes in – getting paid for your mission. There are customers out there who will support the mission of good journalism. It is now our job to find them. Whether those customers are interested in supporting journalism from a philanthropic stance, or a civic stance or a nostalgic stance, we need to be actively finding those patrons and getting them involved in our industry. Because remember, if you insist on covering news that is noble, important, and that nobody pays you for – you have already found a patron: YOU. Without someone paying you to do this journalism, you are donating your time and resources for this cause. Now, if that is your organizational goal and mission – then great. But you need to make sure that you have other dimensions supporting your mission work. But I contend that you would be better off finding patrons, rather than being drafted into the role of reluctant patron yourself. Now, for a real confusing question, let me jump back to something that I just glossed over and ask you this … what is a customer? In the media, the answer isn’t as clear-cut as you might think.